The plan to reopen all 131 arches under the iconic Long Bien Bridge would give the area a fresh face, authorities say. News of a possible revamp to Long Bien Bridge has been speculating all over Gam Cau, a cramped, 10-ft wide street running alongside the historic structure. Its residents have been eagerly discussing the news over green tea, noodles and family meals in kitchens that overlook the bridge's sealed arches. 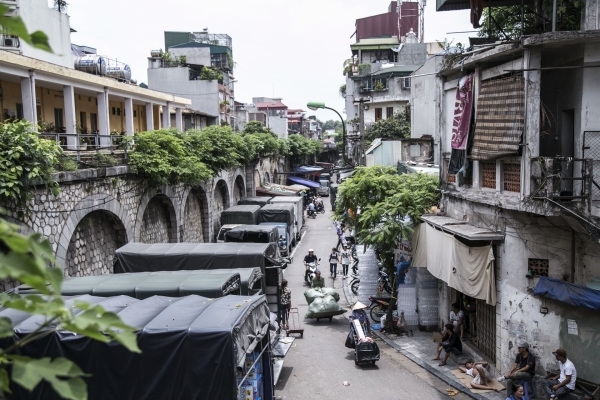 Gam Cau Street, literally meaning “under the bridge”, is separated from Hanoi’s Old Quarter by the century-old Long Bien Bridge, whose arches were sealed over four decades ago. But last week, authorities announced plans to reopen the 131 arches and transform the area into a tourist hub. Hanoi Mayor Nguyen Duc Chung said the project is part of a masterplan to create more living and cultural spaces for Hanoians, who have already seen the recent openings of a book street and a pedestrian zone around Hoan Kiem Lake. 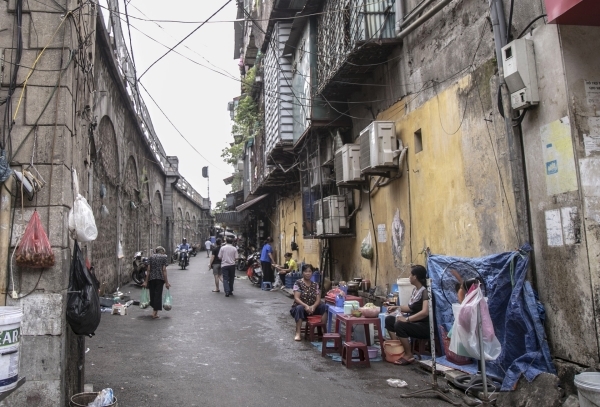 Authorities expect the project to boost tourism and ease traffic along Gam Cau Street, which has been run-down and overloaded due to years of neglect. 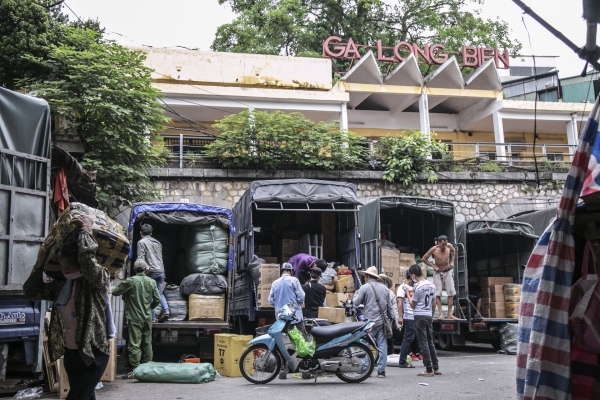 Despite its strategic location near the center of Hanoi, and as a transit point for goods being transported from the inner city to surrounding provinces, Gam Cau has been largely ignored by the city's urban planners. The city’s plan to revamp the area has been with met skepticism by the majority of residents, especially when, as Hong pointed out, no one has asked them what they think about the idea. Most of the information surrounding the plan remains hearsay. Some residents have heard about it in the news, while others get their updates from neighbors and family members who get the latest gossip at work, so many are unsure how to react to the prospects of change. One thing is for certain, they all think the reconstruction will change their lives, for better or for worse, much the same as when the arches were sealed in the first place. Residents at Gam Cau Street are uncertain how the plan would turn out, and how it would affect their daily life. 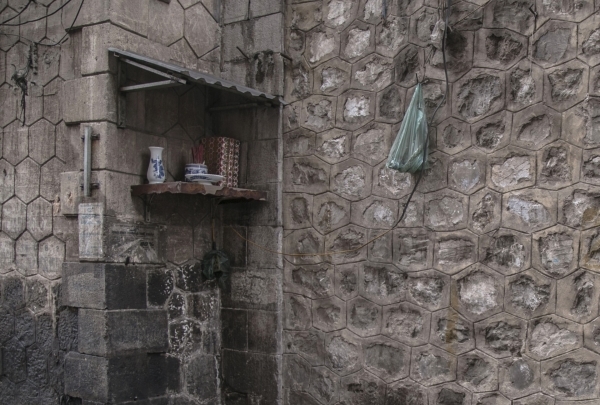 Gam Cau Street used to be a ghetto haven sought out by people of mixed backgrounds: the countryside migrants, salesmen, smugglers, bricklayers, unemployed, homeless, addicts, hustlers. In Vietnamese there is a word for a place like this — xóm bụi, or hamlet of the dust. To this day, those residing there are still mainly from the lower working class, selling everything from street food to glassware. Le Thi Phuong, whose family moved there back in the 1960s, said after the arches were sealed four decades ago, the entire street was in a way, filtered from the dust: there was less crime, fewer drug addicts and as a child she was no longer afraid of being mugged on her way home from school. The arches, built entirely of stone, were erected to support the 5,500-ft Long Bien Bridge, which was constructed in just three years by Société Daydé & Pillé at the end of the 19th century. 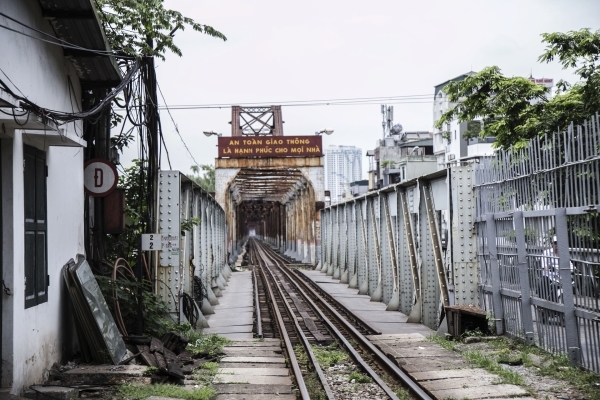 Given its long history, the bridge has born witness to the ups and downs of Hanoi, and many of the events are still vividly ingrained in the memories of those living nearby. Among the most recent was a fire at Dong Xuan Market in 1994, when a short-circuit led to an inferno that destroyed the largest indoor market in Hanoi. Devastated by the irreplaceable loss, and with nowhere else to go, many small traders turned to Gam Cau, lining up along the tiny street to sell what they had left. Nga, a shoe vendor, is among those who decided to settle on Gam Cau Street for good, even though business was nothing compared to Dong Xuan Market, she said. The city’s plan to reopen the arches excites her because she believes it will open up more business opportunities for the vendors who have been struggling to make ends meet. Gam Cau Street is a connecting point for transporters from all over the city to come unload and deliver goods elsewhere. Leaving the cultural and social potential aside, there is a structural aspect to consider if the arches are reopened. They were originally sealed to stop petty crime and to prop up the eroding bridge. “The water would run down from the bridge, building up layers of dirt and mold. It was probably why they filled in the arches, because they were too rusty,” she added. These safety concerns have also been recognized by authorities, who are inviting experts to look into the feasibility of the project. 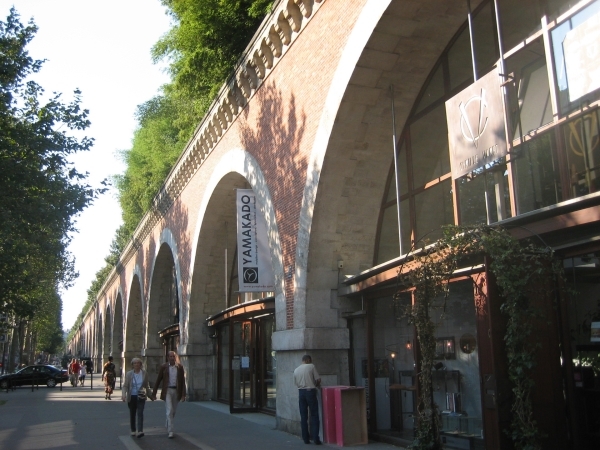 Le Viaduc des Arts in Paris. Photo by Ontario Growth Secretariat, Ministry of Municipal Affairs and Housing/CC by SA 2.0. 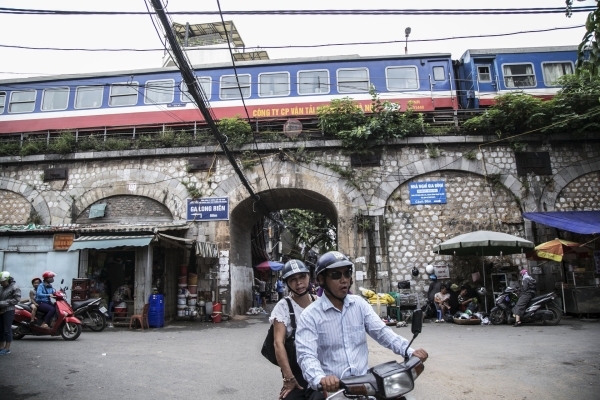 Emmanuel Cerise, co-director at the Hanoi Institute for Urban Policy (IMV), applauded the plan and said he thought it would lead to more opportunities for the redevelopment of the area, but warned that more technical studies should be taken before it goes ahead. “It is possible to have the arches opened up on one side, but the general structure of the bridge as a whole needs to be strengthened,” Cerise wrote in an email to Vnexpress International. He cited an example of a similar structure in Paris, Le Viaduc des Arts, which was restored to become an art space with shops and galleries. But the big difference is that there are no trains running above Le Viaduc des Arts. Back in Gam Cau, despite the skepticism, residents who have nothing else to lose are still clinging onto the hope that the reconstruction will turn their lives around. “It would make it easier for business, for sure,” said Loan, an unemployed 54-year-old. During the day, the street is full of trucks and drivers, but when night falls, most people leave. “The only ones left lurking around are probably drug addicts,” said Loan, sipping tea and looking over Long Bien Railway Station. Long Bien Bridge is already 100 years old, yet it's still hosting five to six trains everyday. 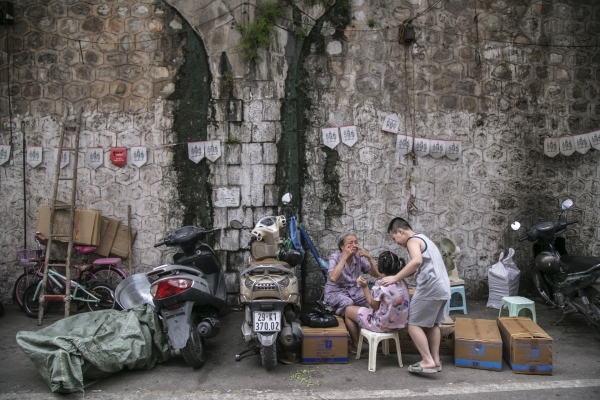 “It has always been a largely overlooked neighborhood, no customers, no tourists," said Ta Thi Hong, a tea vendor. But most of the residents remain positive about the plan, even though they are uncertain how the reopening of the bridge arches would be executed. 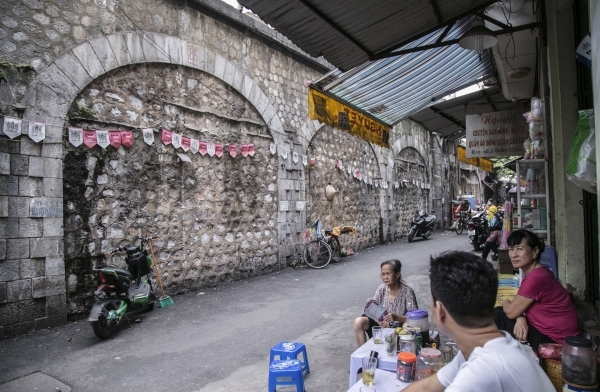 Le Thi Phuong, who has been living on Gam Cau Street since she was a child, said she remembered the arches were sealed because there were too many petty crimes in the neighborhood. Long Bien train station locates at the end of Gam Cau Street.